I made Nian Gao/Traditional Chinese New Year Cake the way my grandmother has done years back during Chinese New Year this year. It took me a good 15 hours to make the Nian Gao the traditional way. It was tedious and hard work, but it paid off eventually. Nian Gao made the traditional way will not become moulded fast and could be stored in cold dry place for years. It also tasted so much better and the texture much Chewier. 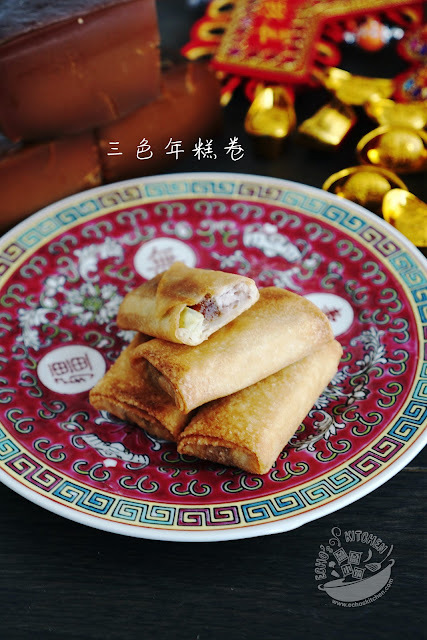 We normally eat Nian Gao deep frying with coated batter, I am trying a new way today using a spring roll wrapper, I have to say that I actually like this one better! I have always thought Kuih Lapis a local Malaysian snack, it was known to me as 9-layered kuih (九层糕 in Chinese）for a long time. 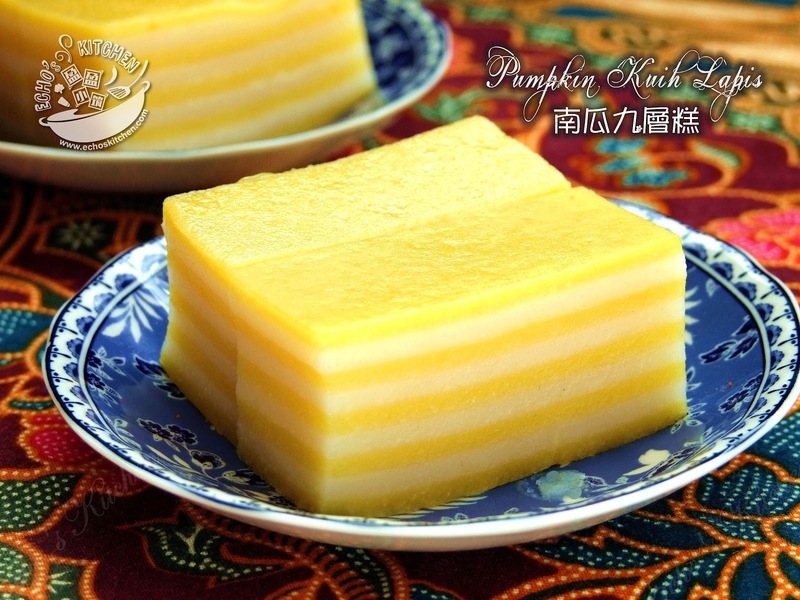 I later learnt that not only the Malaysian, the Singaporean, Indonesian, Thai and Vietnamese all have similar versions of this cake, the difference are mostly on the ratio of rice flour and starches. I have also learned that 9-layered cake is a specialty made in Hainan and Canton province in China during festive seasons. Its name implies "longevity and growing upwards" It is also something that is made only for prayers and serves only to family members. It is not to be shared with outsiders as luck and prosperity should be preserved within the family. As its name suggested, there should be nine layers in this kuih, hence I designed my recipe based on that. It is normally made with food coloring (red being the most common choice) in my country. I made mine with pumpkin for its sweetness and bright color, I am really pleased with the color! For those who has been following my blog, you would have noticed that I had been experimenting with ground rice instead of rice flour in recipes lately. My Chee Cheong Fun (steamed rice rolls) project got me obsessed to ground rice, the texture and taste a freshly ground rice provides is simply out of the world. 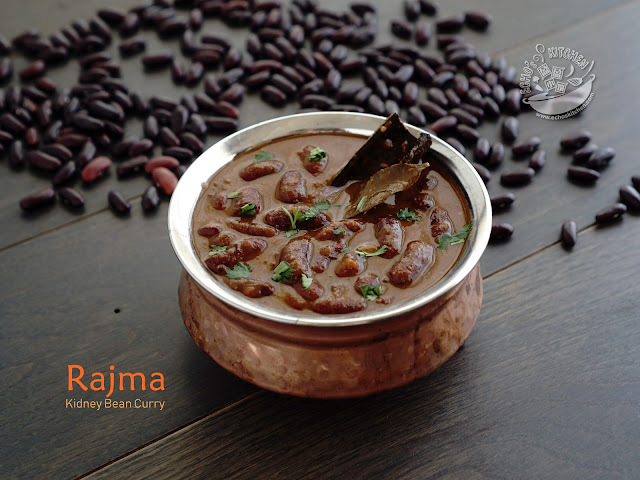 It is truly worth the while and it is hard to go back to the ordinary rice flour now. Lou Shu Fun/老鼠粉 (“rat noodles”) also known as Ngan zham fun/银针粉(“silver needle noodles”) is a kind of noodle made of rice flour and some starches, it is short, springy and somewhat translucent in color. One popular way to serve this noodle in Malaysia to make it a clay pot dish, clay pot retains heat well and makes the dish more appealing. Years back in my hometown, there was this lady riding a motorcycle with a big metal box selling her homemade Chee Cheong Fun every morning. Her Chee Cheong Fun was soft, smooth and full of rice fragrance (米香）with a slight touch of sourness. Her sauce was a good balance of sweet and salty, together with fried shallots and roasted sesame, her chee cheong fun performances an orchestra of flavors in the mouth, it was very addictive. My parents normally purchased her Chee Cheong Fun only over the weekends. I get real excited waking in the morning to see packets of Chee Cheong Fun sitting in the cupboard ready for breakfast. 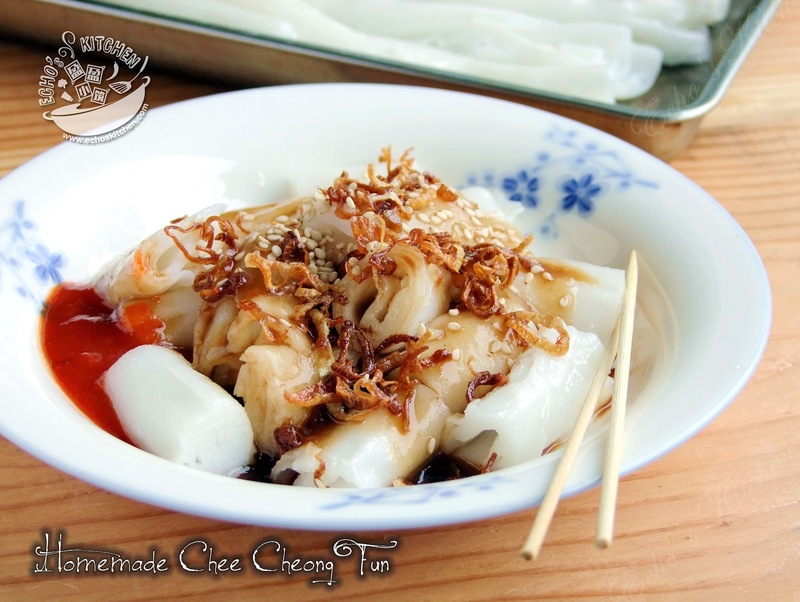 Unfortunately, she stopped selling Chee Cheong Fun due to her health condition. I can no longer enjoy a packet of her Chee Cheong Fun now when I visit my hometown. I did, though, encountered good Chee Cheong Funs at different places over the years. But none, came close to what this lady has made. There is something about her Chee Cheong Fun that I can't forget. A sense of pureness and simplicity that machine made Cheong Fun can't replicate. It comes only through years of day-to-day hard work, melding with patience and care, an art and heritage. With that in mine, I wanted to recreate the kind of Chee Cheong Fun I missed. I tried many recipes online and was disappointed most of the times. But I learnt something new every time. I did, finally came to a formula that my palate agrees. It is made with only rice, water, oil and salt. No cornstarch, wheat starch and tapioca flour added. I present you : A simple tale of steamed rice rolls. Just like how it should be, long long time ago. I had Spaghetti Naporitan the first time as an exchange student in Japan 20 years ago. I thought what I had was Italian food for the longest time, not until I went to Europe that I realized that it was actually a Japanese food in disguise! 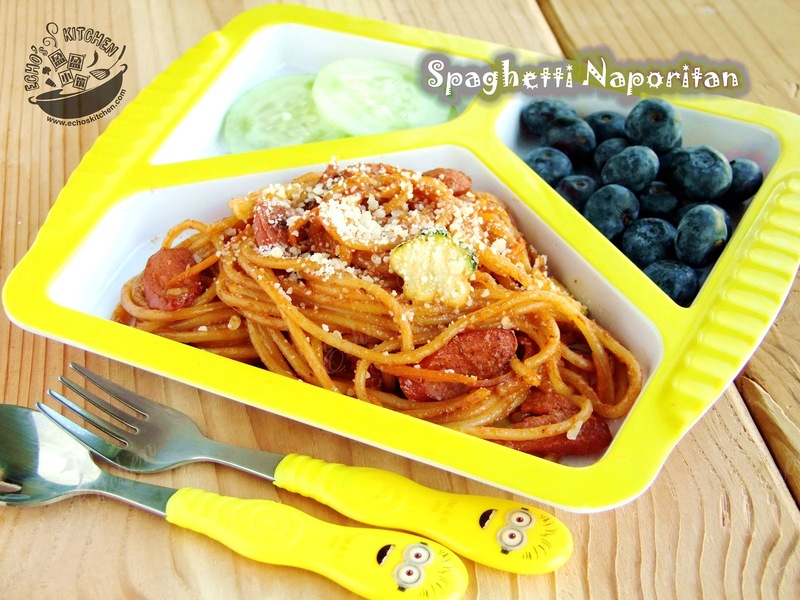 Spaghetti Naporitan is pan-fried spaghetti seasoned with ketchup, which makes it a very easy and quick dish to make since there is no preparation of meat sauce needed. My son A is a big fan of ketchup and often asked for fries/nuggets for dinner so that he could have them with ketchup. It was an instant hit, A had it two nights in a roll and was loving it! 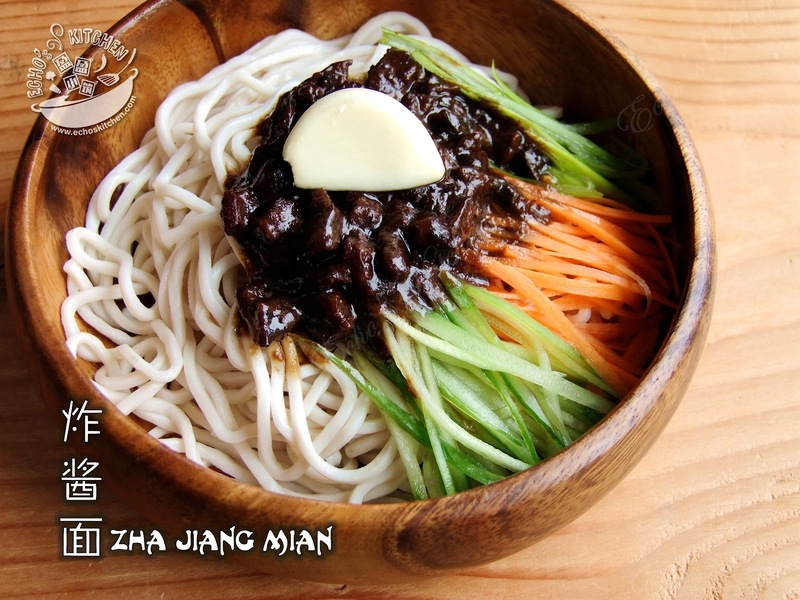 Zha Jiang Mian literally means "Fried Sauce Noodles", a northern Chinese dish consist of thick wheat noodle and topped with ground pork stir-fried with fermented soy Sauce and Sweet Sauce (甜面酱), it is normally served with plenty of seasonal vegetables, which makes it a lot more nutritious and healthier.